The motive behind this book are noble; to raise funds for a new statue of Herbert Columbine in his home town of Walton on Naze. The statue was officially unveiled in August 2014. Herbert was awarded his Victoria Cross for an act of gallantry during the German ‘Spring Offensive’ of 1918. It was an act that would cost him his life. His citation is just a few lines long, but in this book Carole McEntee-Taylor has put together an account of his life and war service. However it is one that I can only recommend with a strong caveat attached. Herbert’s father, also named Herbert, had been killed in the Boer War, and a couple of chapters are devoted to this. Much is made of how this influenced Herbert’s decision to join the army himself. The narrative moves on to the family’s move to Walton and what the town was like, before covering Herbert’s enlistment into the 19th Hussars in 1911. He was in the First World War from the beginning, seeing action at Mons. Yet by all accounts his war was fairly ‘quiet’. He joined the Machine Gun Corps (Cavalry) in June 1916, and it was whilst manning a machine gun in March 1918 that he was killed. Herein lies the problem with the book. There is not a great deal of information about Herbert; he was an ‘ordinary’ soldier who had an ‘ordinary’ war. His story has therefore been bulked out with a general narrative about the course of the war, but even in this respect it is lacking. It jumps from 1915 to 1916, with the Somme getting barely a mention. A chapter is devoted to the Battle of Bellewaarde but it is not clear that Herbert or even his battalion played any part in the battle. Intertwined with this narrative is prose describing the thoughts and feelings of Herbert and his mother. Whether these parts are based themselves on fact or supposition is not clear; there are no letters or diaries listed in the sources and no bibliography, and although ‘letters home’ are mentioned none are reproduced, making it seem to me that they are a product of the author’s imagination rather than first-hand evidence. If they have been imagined by the author, even couched in the factual evidence available, they are still imagined and not necessarily representative of the actual thoughts and feelings these people had. 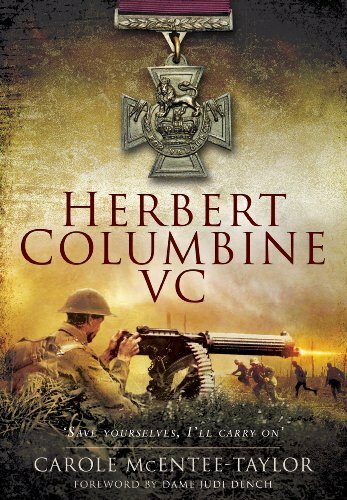 At its core Herbert Columbine’s story is an interesting one and there is no doubt that he showed great courage and bravery in the action for which he was awarded his VC. But other than this his short life was unremarkable and not enough to fill a whole book. I think the author realised this too and has therefore bulked the book out with the additional narrative and prose. Personally I am uncomfortable with this approach as in my mind it attributes personalities that may or may not be a true reflection of the person. Despite my misgivings I think it the narrative is very well written and packs in a lot of details about the soldiers’ life and the battles and campaigns of the war. I leave it for other readers to make their own minds up as to its veracity.